The social network's new "stories" feature is a clear shot at its much smaller competitor. Does it really need to be worried? On Tuesday, Instagram announced "Instagram Stories," a new feature that lets users share multiple photos and videos that disappear after 24 hours. This should sound familiar—it’s exactly what Snapchat has based its entire platform around since its creation in 2013. It seems that Instagram is going after the strong engagement that Snapchat has seen with ephemeral content. 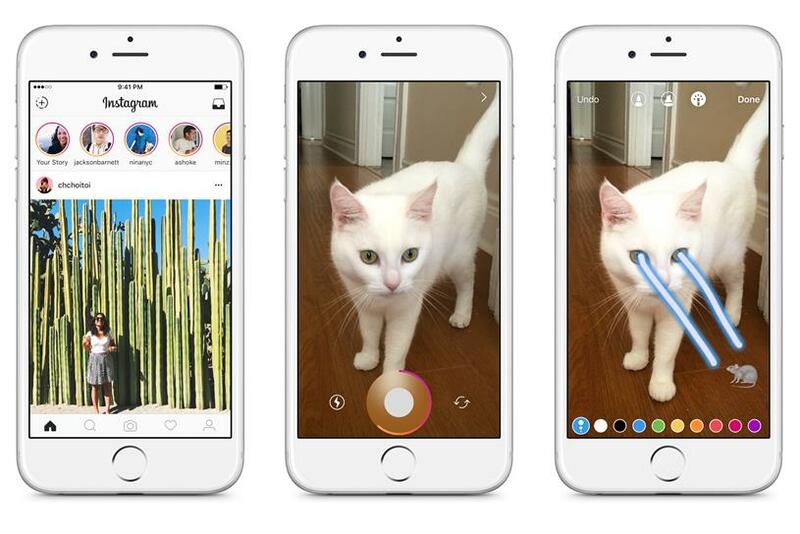 ‘Instagram Stories’ aims to get people to share all moments of their lives instead of perfectly filtered highlights. "With Instagram Stories, you don’t have to worry about overposting," wrote Instagram in a blog post on Tuesday, "Instead, you can share as much as you want throughout the day — with as much creativity as you want." For the social network’s "Stories" feature, users will see stories from people they follow in a bar at the top of their feed. To view a friend’s story, users tap on profile photos, which will bring up a secondary feed of that person’s stories. A colorful ring will appear around the profile photos of users who have something new to see. Similar to Snapchat, "Instagram Stories" users can also post send private messages in Instagram Direct by tapping on the photos and videos they see—without likes or public comments—and users can add text, stickers and drawings to their snaps—er, stories. Users can also choose to set their accounts to private so that stories are only visible to their followers, or choose to block select followers. Instagram got celebrities like Nick Jonas, Demi Lovato and Serena Williams to create their own Stories to promote the new feature. But many are calling the move a blatant rip off of Snapchat. By noon, the news was trending on Twitter. Users and social influencers like YouTubers Dan Brian and Mariam Diamond expressed their annoyance of how similar the social networks have become. Although I'll probably get addicted to Instagram Stories,I do dislike when different platforms copy each other ! #InstagramOrSnapchat ? Instagram stories? Really? Uh we have snapchat for that ?? "Let’s face it, it’s a virtual clone of Snapchat," said Benjamin Arnold, group account and business director at We Are Social. "They’ve taken a proven and popular mechanic and replicated it for their audiences." But should Instagram really be concerned with the growth of Snapchat? Even with Snapchat’s rapid growth, Instagram boosts more than 300 million daily users, twice as much as Snapchat (As of June, Snapchat has brought in 150 million daily active users, according to Statista). And Facebook, Instagram’s parent company, reported blockbuster second-quarter earnings last Wednesday, driven by mobile ad sales and an increase in the number of viewers. Arnold calls it a smart move "Instagram has been trying to increase native sharing for some time and has seen a slowdown in the rate of growth of active users, especially in the US," he says, "During that same time, Snapchat has really redefined social communications—away from polished and perfect every time, to real, unfiltered and more personalized." While it’s possible that the new feature keeps more users within the app, Arnold says that marketers shouldn’t assume the social network will get a boost. "Negative consensus around imitation can hamper technological changes and rollouts like this," he said. "There are countless examples where channels have replicated innovation from competitors but failed to deliver expected adoption rates." One example, he says, is Slingshot, one of Facebook’s many failed attempts at duplicating Snapchat after failing to acquire the start-up in 2013. Other standalone apps like Poke and Instagram Bolt were removed from the stores after failing to attract users. One thing is for sure, says Arnold—"it’s safe to presume similar advertising opportunities will be replicated by Instagram."